God is truly teaching our entire family about ETERNAL PERSPECTIVE. Our 12-yr-old son Caleb has spent ALOT of time in the hospital with his brother Trey. He is always happy to do it, even though he has to sacrifice. 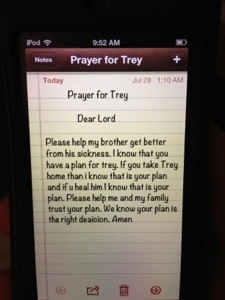 Last night he was there when Trey had to go to the ICU, and it was a scary moment. Later that night, Jeremy and the kids were talking about what happened. Caleb really broke down. He has never been one to want to pray out loud, but he asked Jeremy if he could. He then,through his tears, said the most amazing, heart-felt prayer for his brother…. Later, Jeremy found this note on his I-pod. All I can say, through my own tears, is AMEN!